Just a short hop across the Tasman lie the islands that make up New Zealand. From the dramatic, mountainous scenery of the South Island to the rolling green landscapes of the North Island, this small country, not much bigger than the state of Victoria is packed with an astonishing amount to see and do. Here are some of the highlights you should include in your Kiwi itinerary. This 223-kilometre, five-hour traverse of the South Island is considered one of the world’s great train journeys, thanks to the spectacular landscapes through which it passes: lakes and rivers, peaks and gorges. As you depart from Christchurch, you’ll head out across the vast Canterbury plains, with the towering, snow-capped Southern Alps coming ever closer, eventually surrounding you as you wind through 16 tunnels and over four viaducts, to emerge on the West Coast. The stunning river of ice sits within a World Heritage Area known as Te Wāhipounamu, and currently covers a distance of 12 kilometres on its journey from high-altitude snowfield to valley floor, terminating in a frozen waterfall less than 300 metres above sea level. A guided helicopter tour and ice-walk are a great way to experience this natural wonder from all angles, exploring the narrow crevasses and blue ice caves that change on a daily basis. If you prefer to keep your feet on more solid ground, you can take a walk up the glacier valley to see the landscape the glacier has left behind as it has retreated up the valley, and you can finish with a soak in the nearby hot pools. The gentle valleys surrounding Queenstown and Wanaka, protected by the encircling mountains, have a unique geography and climate that produces some of the best wines in the world. There are plenty of cellar doors to choose from if you want to sample them for yourself, or you can simply enjoy a leisurely meal among the vines and soak up those amazing views. 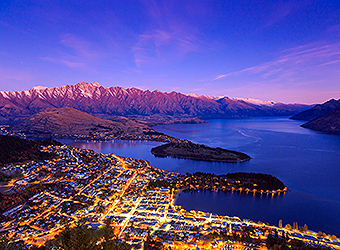 There are few more dramatically-located airports than Queenstown, nestled in the heart of the Southern Alps. From the moment your plane descends between the peaks to land just a stone’s throw from the shores of Lake Wakatipu, you’ll find yourself captivated by the surrounding mountains, which from winter to spring become home to some of the best skiing and snowboarding in the world. With two fields within an easy drive of the town (and two more just a little further away), you’ll find yourself spoilt for choice, regardless of your ability. And if you fancy a break from the slopes, Queenstown and the quaint nearby village of Arrowtown offer plenty of other things to see and do. Take a geothermal wonderland of shooting geysers, natural hot springs, and bubbling mud pools, add mountains, rivers and no less than 18 lakes, each more tranquil and lovely than the last, sprinkled with a taste of authentic Maori culture, and you have a holiday experience like no other. Walk through ancient native forest, take a mountain-bike ride through towering redwoods and finish your days with a traditional Hangi and cultural performance. You don’t have to be a fan of the Lord of the Rings or Hobbit movies to enjoy a day at this unique attraction, which is set in the heart of the bucolic Waikato countryside. Well over half a million visitors have now visited this former movie set, which offers a fascinating view into the world of Hollywood movie-making, along with a chance to enjoy a traditional ale in the famed Green Dragon Inn. There’s much more to see in both the North and South Islands, and one of the best ways to experience them is in the hands of an experienced coach tour operator. If sitting back and letting someone else do the driving while you enjoy the view sounds like your kind of holiday, ask your personal travel manager for details.